Classification and species list from Roy (2004). Mukherjee, T. K., A. K. Hazra, and A. K. Ghosh. 1995. The mantid fauna of India (Insecta: Mantodea). Oriental-Insects 29:185-358. Nel, A. and R. Roy. 1996. Revision of the fossil "mantids" and "ephemerid" species described by Piton from the Palaeocene of Menat (France) (Mantodea: Chaeteessidae, Mantidae; Ensifera: Tettigonioidea). European Journal of Entomology 93:223-234. Roy, R. 2004. Revision and phylogeny of the Choeradodini Kirby, 1903 (Dictyoptera, Mantidae). Bulletin de la Societe Entomologique de France 109(2):113-128. Terra, P. S. 1995. Systematics of the Neotropical genera of praying mantis (Mantodea). Revista Brasileira de Entomologia 39(1):13-94. Wood-Mason, J. 1880. Synopsis of the species of Choeradodis, a remarkable genus of Mantodea common to Indian and Tropical America. Journal of the Asiatic Society of Bengal 47(1):82-84. Drawing from M. Beier. 1935. Mantodea. Fam. Mantidae. Subfam. 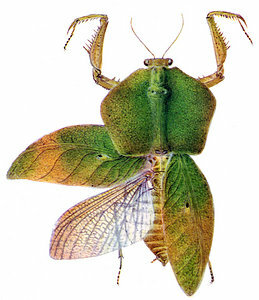 Orthoderinae - Choeradodinae - Deroplatynae. Genera Insectorum de P. Wytsman 201:1-10. Page: Tree of Life Choeradodinae. The TEXT of this page is licensed under the Creative Commons Attribution-NonCommercial License - Version 3.0. Note that images and other media featured on this page are each governed by their own license, and they may or may not be available for reuse. Click on an image or a media link to access the media data window, which provides the relevant licensing information. For the general terms and conditions of ToL material reuse and redistribution, please see the Tree of Life Copyright Policies.